Two of my artsy craftsy favorites have linked arms for a beautiful kit! 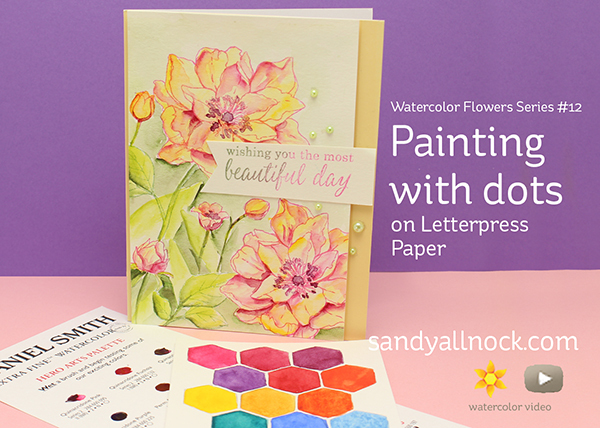 There’s a special palette of Daniel Smith paints (in the form of a dot chart) along with Hero Arts stamps, dies, paper, a brush…everything you need in one lovely kit! How perfect! Watch the video below or click HERE to see it in HD on YouTube. The kit is pretty fantastic especially for a new watercolorist. 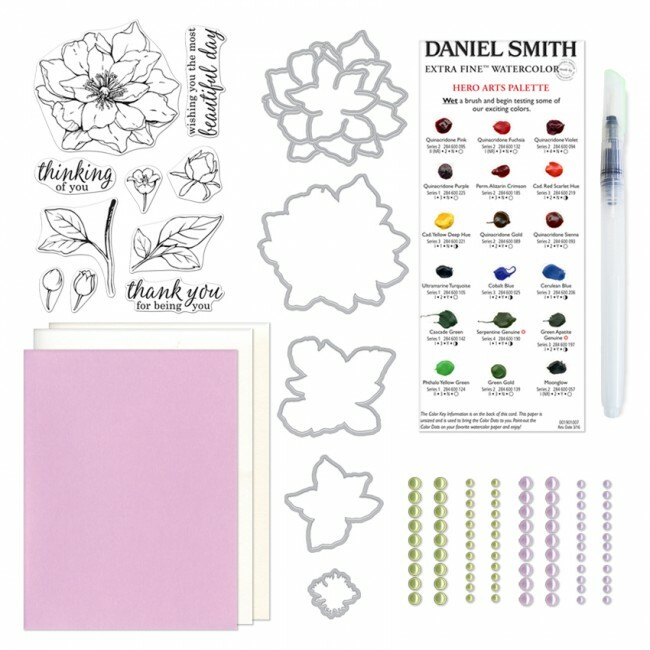 It’s an easy way to get a stamp and die set that you can use independently (I wanna color that flower with my Copics!) along with card bases and paper – and a brush and paints to try out! A 4×6 clear stamp set. A set of four Frame Cuts dies, designed to cut and stack the flower into a layered element. Stamp the rose four times to use with these dies. A Paper Layering die, which allows you to pop-up a single stamped rose for a different dimensional look. 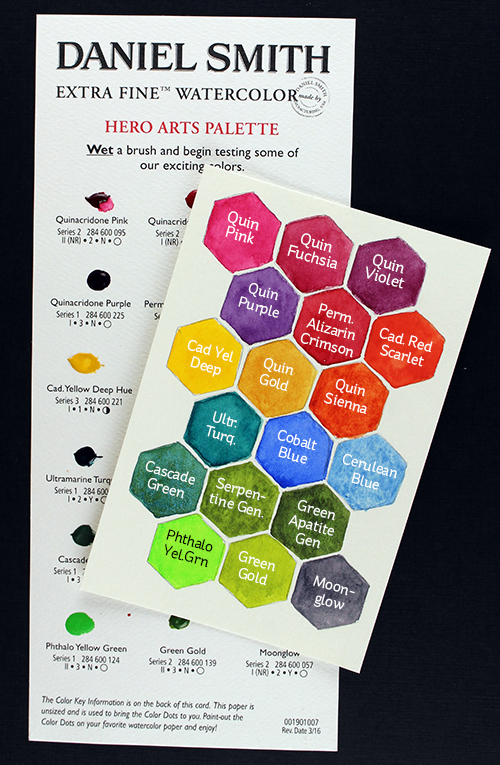 A dot sheet of DANIEL SMITH watercolors in a palette specifically selected for Hero Arts. Each dot of paint allows watercoloring of 2-3 images, to give you an introduction to these wonderful paints. Letterpress paper (heavy cardstock) in cream and white, notecards and pearls. DANIEL SMITH watercolor paints in 15ml tubes – 18 colors in all, the colors used on the Hero Arts Palette dot sheet. Hero Arts is giving away one kit as a prize to one blog reader (see their post HERE) – selected from the comments across all of the blogs in the hop. Go leave love all over to qualify to win! Because, well, I have more. LOL. #0versharer! Quick Tips series – we’re about midway on this short and easy-to-understand technique series every Sunday! Gorgeous… But I wouldn’t expect anything less from you! What an utterly gorgeous card! I’d flip out if this beauty landed in my mailbox!! Wow, gorgeous! I’m glad you continued, I love what you created. She makes it look so fun! In case anyone wants to know – I compared the kit’s 18 colors to the 66 Try It Color Sheet. Unless i made a mistake, 11 are the same and 7 colors are different. On the kit’s pallet, the bottom row of 3 are not on the 66 pallet; the 6th row of 3 are different; and Perm. Alizarin Crimson in 2nd row is different. I figured I’d share this. I just wanted to share: I got the kit, stamped the large flower in a pale putty color, painted it in yellows, and I even made my own brown color with the quin gold and moonglow!!! It turned out gorgeous and will be the star for my mom’s Mothers’ Day card! I so wish the art teachers I had as a kid had shown us how much fun it is to play. I got so focused on the finished project, which never turned out too well, that I didn’t know about the play (and experimentation) aspect. But…I am having fun now! And discovering that everything I do isn’t awful! Thanks for your gentle and kind encouragement, always suggesting ways to do things and emphasizing the experimentation aspect of the whole process. Your work is amazing, but your kindness and generosity and sweetness of spirit is what draws people (me). And you are funny and fantastic! (The first video of yours I saw was the scrap wrangler set!) Thanks for all you do and are. Pretty card. This is just the best kit. I am not surprised you came up with such a lovely card Sandy. I love your work! Wow! Great release!!!! I love this new kit! And your card is absolutely gorgeus!!!! This might be my favorite of the blog hop so far! Color and design are WONDERFUL!!!! You always make lovely things and your watercoloring is great! I really love this flower stamp!! The color combo here is amazing. Simply beautiful as always. Love watching you paint! Wow, wow, wow! This is gorgeously, amazingly, stunningly beautiful!! Thanks for sharing your talent with us! Love how you used the colors to create such dimensional flowers. Beautiful piece of art! I just love the soft look of your flowers and all the shading. You are so talented! Love how you colored the flowers. You are truly an artist! I think your card just is stunning and certainly stands out. Beautiful choice of color and arrangement. What an amazing piece of art. Simply beautiful! 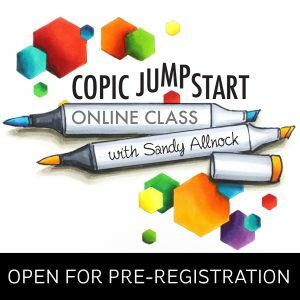 Gorgeous coloring as your usual professional standards! You make it look easy. Thanks for sharing!